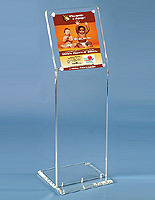 These acrylic stands, also known as sign holders, are modern looking advertising tools. 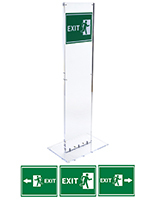 These acrylic stands are manufactured with 3/4" thick, polished acrylic and stand 45" high. 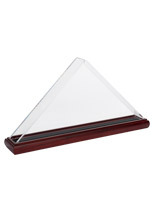 Acrylic displays are durable and strong. 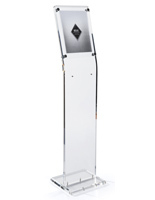 Clear stands are ideal for busy areas like bank queue lines, hotel lobbies, retail front doors, and large offices. 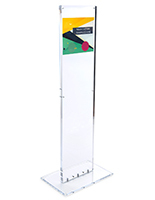 A sign holder is included with this clear display stand for advertising an 8-1/2"w x 11h sheet straight from your printer! 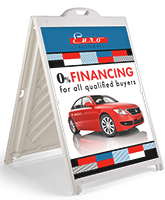 The sign holder display has a PVC lens frame cover. The PVC frame protects graphics from tampering. To place your graphic into the holder, lift the frame from the top and insert the graphic. Two side magnets secure the graphic from falling out. The sign holder displays an 8-1/2"w x 11"h standard graphic. 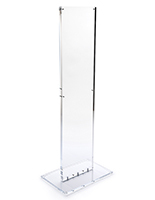 These clear acrylic display stands are shipped in two separate pieces, but are easy to put together, taking only minutes to assemble. 11.8" x 45.0" x 10.3"